When Will The Milky Way Collide With Andromeda? Our galaxy does indeed! The Milky Way is one of two large galaxies that make up what’s called the Local Group, which contains some fifty-odd galaxies. The other large galaxy involved is Andromeda, our closest galactic neighbor; our galaxy and Andromeda are slowly orbiting each other. The rest of the Local Group are mostly small things, like the Large or Small Magellanic Clouds, which are gravitationally tied to either the Milky Way or Andromeda, and orbit the larger galaxy to which they’re bound. 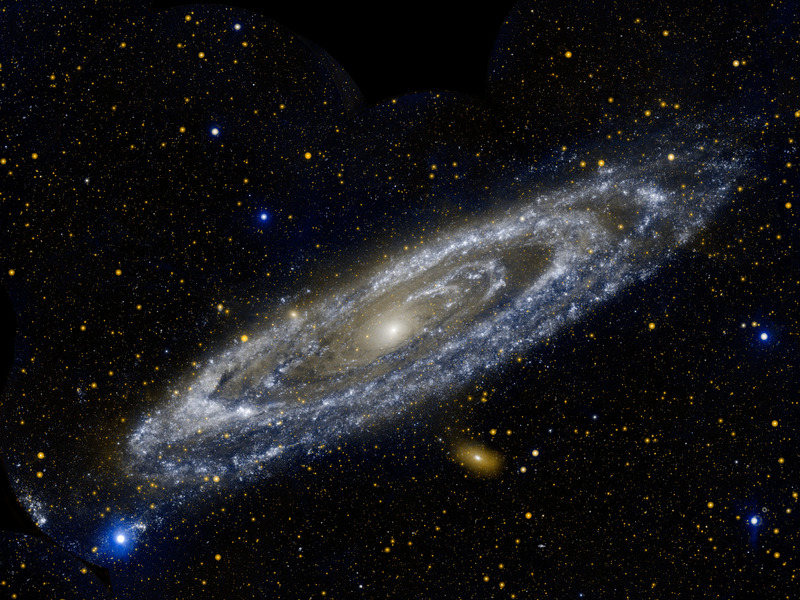 Andromeda weighs in somewhere between 700 billion solar masses and a trillion solar masses. This is approximately the same mass as our own Milky Way, which is also usually considered to have about a trillion solar masses worth of stuff hanging around. If you want to figure out how any two objects are going to orbit each other, you want to know their mass, how far apart they are, and how fast they’re moving relative to each other. With this information, you can determine what path the two objects will take relative to each other. The main thing we need to be concerned with right now is the mass. The masses of your two objects - in this case, the Milky Way and Andromeda - determine the point around which both objects will orbit. This is called the centre of mass, and is defined as the point in space that has an equal distribution of mass around it. For a system like the Sun and the Earth, the Sun contains almost all the mass - the mass of the Earth being so far away doesn’t really change the center of mass very much. The Earth only pulls the Earth-Sun center of mass the tiniest bit away from the centre of mass of the Sun itself. But if the two objects are close to each other in mass and widely separated, the center of mass is actually between the two, in empty space! This is the case for Pluto and its moon Charon, which are close enough in mass that they both technically orbit a point above the surface of Pluto. You could scale up your question - does the Local Group as a whole orbit anything? And it does - the Local Group is part of the Virgo Supercluster, which in turn is in motion relative to even larger structures in the universe. Nothing is truly at rest, after all.